...then I started machine quilting with red thread using the edges of the I Spy blocks as my guide. 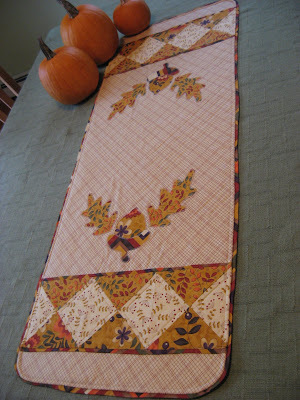 I'll stitch 1/4 inch from each edge of each block going in both directions, vertical and horizontal, for the quilting. I thought the red would look good with the denim fabric. This coordinating stripe was the perfect fabric for the binding I will make and apply when I have time after returning from vacation. I think it will make a very cheerful little boy quilt, don't you? I agree that this quilt is perfect for some lucky little guy! Oh, do I love this little quilt. I am inspired to make one for my little grandson. 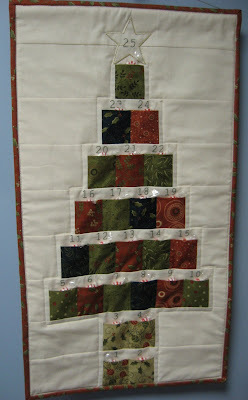 I think I can handle this even though I am not a "quilter" by any means. The quilt will be well loved... It's darling! Very cute! I'm sure any little boy would love it.